The book world has have been taking about this book for months, and rightly so. It is an incredible debut, gripping you from the start and not letting go until that ending. 'The Silent Patient' allows us to follow forensic psychotherapist Theo Faber, through his journey with the notorious Alicia Berenson. Alicia was a successful artist who hit the headlines when she was found alone with her murdered husband Gabriel. Gabriel was shot in the face five times, and Alicia's were the only prints on the gun. She has never admitted her guilt, nor has she protested her innocence. She has been mute since the day of the murder. Six years on and Alicia is a patient at a closed psychiatric unit called The Grove, the hospital setting is perfect for the atmosphere of this novel, and their treatment of Alicia before Theo's arrival is exactly as you might expect. Theo who has been fascinated with Alicia's case since the start, applies for a role at the Grove and is successful. He believes that he can make Alicia speak again, his colleagues are unconvinced and think Alicia is a lost cause. He is determined to get her off some of the heavier medication that she is on and move forward. I literally cannot say anything else (I'm keeping the silence about that ending!) but I can honestly say that I was completely shocked by it (I read so many novels that it's hard to shock me these days, I genuinely gasped out loud!). Absolutely brilliant, can't recommend it highly enough. I know it's still early, but this is definitely one of the books of 2019. 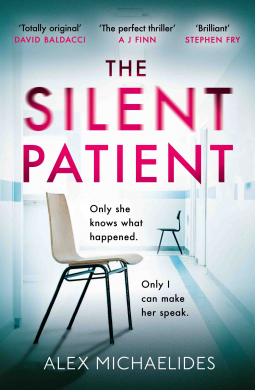 The Silent Patient is available now via Amazon online and all good book shops.